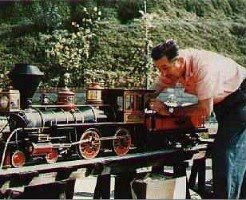 Years before Disneyland, Walt Disney built a working steam train layout featuring a half mile of track in the backyard of his home here in Los Angeles. While Disney's home was very modest, it was located on a five acre lot, huge by any standards. In the center of the layout was the red barn where Disney would "tinker" and work on various projects. The ideas for Disneyland were born in Walt Disney's barn. Today Walt Disney's barn is located in Griffith Park here in Los Angeles. It's open to the public free of charge the 3rd Sunday of every month. Disney's home was located at 355 Carolwood Drive in Homby Hills in Los Angeles. After the house was sold about ten years ago, the barn was moved to Griffith Park. Disney called his layout the Carolwood Pacific, named after the street he lived on. 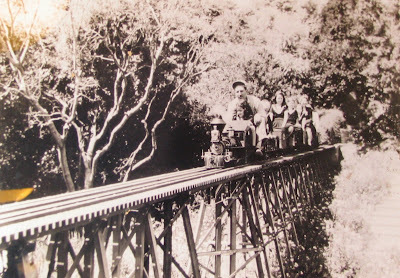 The train engine (pictured) was called the Lilly Belle, named after his wife Lillian Disney. The Lilly Belle is on display at the barn, along with other mementos from the layout. 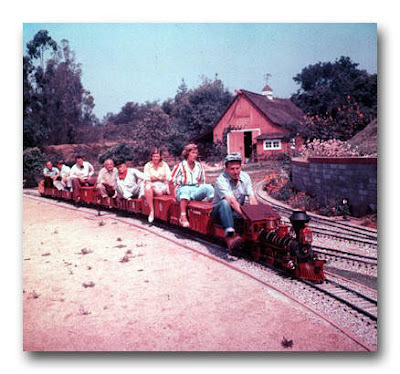 The train at Disneyland is simply a larger version of what was found in Walt Disney's backyard. This past Fathers' Day, our family got a chance to (finally) see the barn, take a ride on the working "live steamers" that circle the barn every Sunday afternoon. My grandfather took me here 35+ years ago, and it's nice to see the track layout has expanded over the years. It's entirely volunteer run and worth seeing. So, what - if anything - can be learned from Walt Disney's barn? Perhaps that complex ideas (Disneyland) are often developed in simple circumstances (in this case, a barn). And that ideas - good or evil, profound or mundane, God-centered or self-centered, eternal or temporal - can outlast us long after our "trains and track" are gone. What we invest our lives in is hopefully passed on to the next generation. The question becomes, is what we're passing on of any significance in light of eternity?